Author(s): Jankowski J., Teisseyre R.
Author(s): Teisseyre R., Jankowski J. Throughout the last half-century, Earth sciences, both theoretical and applied, have undergone a fundamental progress owing to the development of new research methods and techniques. At the same time, new self-consistent theories have been created as regards the Earth interior dynamics and plate tectonics, describing chemical phase evolution and dynamics of convection, deformation and failure processes. These theories and new concepts have united different branches of Earth sciences: geophysics, geology and rock mass mechanics. The new methods and techniques include deep recognition of the Earth's structures, development of mathematical-physical modeling methods and numerical simulation of evolution and dynamic processes. Of major importance is also modern monitoring of the environment, including that done with the satellite techniques. In this general context, the major achievements of the research done at the Institute of Geophysics have been outlined in the following groups of problems"
It is difficult to point out and evaluate in this summary the highlights of our achievements. Many results of theoretical studies and global and regional surveys are certainly of major scientific importance, highly acknowledged by scientific community. 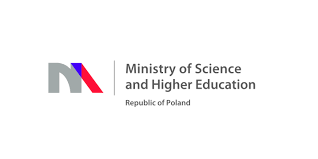 The Chronicle presents major events, both scientific and organizational, that took place at the Institute of Geophysics, Polish Academy of Sciences, throughout 50 years of its activity. The Institute was founded in 1952 as a Department of Geophysics, to be transformed into the Institute of Geophysics in 1971. The main directions of activity, most important events and achievements of the Institute as a whole and individual departments are briefly discussed. Much attention is paid to the description of geophysical observatories and instruments operating there. The Chronicle includes also the departments and laboratories that were part of the Institute in the past. In the last part of the Chronicle we commemorate our colleagues who passed away. Author(s): Dziembowska A., Gadomska B. Since the very beginning of the Institute of Geophysics, great attention was paid to the documentation of the results of scientfic work. This was the domain of activity of Dr. Kazimiera Ołpińska-Warzechowa. She carefully prepared five comprehensive bibliographies of papers written by staff of the Institute of Geophysics. She also left valuable publications dealing with the history of geophysics and distinguished Polish geophysicists. Acta Geophysica Polonica is analysed as a mean of international scientific communication in the context of its contribution to the world's science. Current data from Science Citation Index Expanded 1996-2003 comprise 374 citations to articles from Acta Geophysica Polonica. Despite acknowledged positions in geophysical society of many countries (Greece, Russia, USA, India, Japan), its international impact on the information transfer is still not very significant, although a markedly growing trend, athe highest among leading Polish geoscience periodicals, is clearly visible. The year 2003 appears to be the most successful in terms of most bibliometric indices. Very promising tendency refers to rapidly increased citation rate of new articles from Acta Geophysica Polonica. This is a confirmation of growing attractiveness of published results and immediate information transfer, paired with improved brief-term journal impact and increased chances the indexation by ISI. Author(s): Dziembowska A., Okrasińska Z. 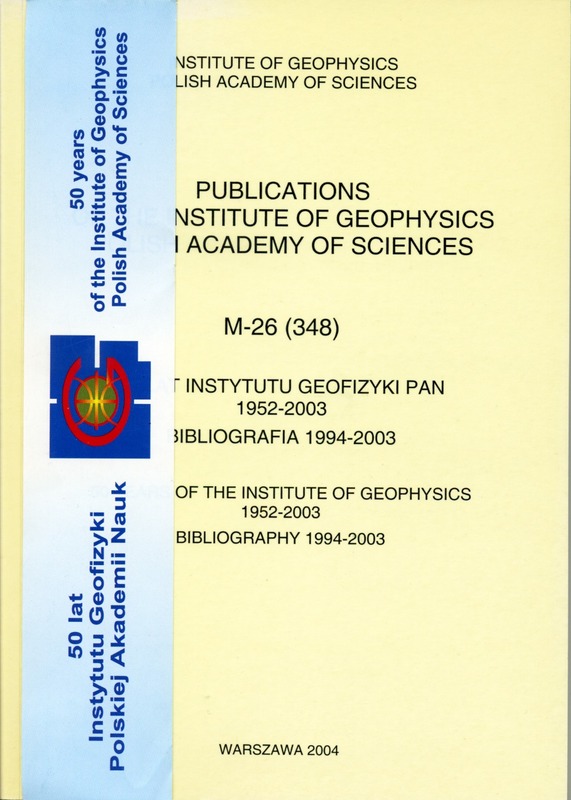 The bibliography contains papers written by staff of the Institute of Geophysics, Polish Academy of Sciences, since 1994. The criterion is that at least one of the authors has the Institute of Geophysics as his affiliation. The set of titles is as complete as possible, and includes not only scientific papers published in renown journals, but also conference materials, abstracts and popular articles. The index presented at the end of the bibliography contains the names of authors affiliated to the Institute of Geophysics and the reference to the numbers assigned to their papers. 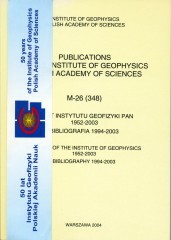 The bibliography, supplemented by consecutive years, will be available at www.igf.edu.pl.